Burlington (Canada 2011 Census population 175,779), is a city located in Halton Region at the western end ofLake Ontario. Burlington is part of the Greater Toronto Area, and is also included in the Hamilton Census Metropolitan Area. Physically, Burlington lies between the north shore of Lake Ontario and the Niagara Escarpment. Economically, Burlington is strategically located near the geographic centre of the Golden Horseshoe, a densely populated and industrialized region home to over 8 million people. Before pioneer settlement in the 19th century, the area was covered by the primeval forest that stretched between the provincial capital of York and the town of Hamilton, and was home to various First Nations peoples. In 1792, John Graves Simcoe, the first lieutenant governor of Upper Canada, named the western end of Lake Ontario "Burlington Bay" after the town of Bridlington in the East Riding of Yorkshire, England,. By the time land beside the bay was deeded to Captain Joseph Brant at the turn of the 19th century, the name "Burlington" was already in common use. With the completion of the local survey after the War of 1812, the land was opened for settlement. Early farmers prospered in the Burlington area because of the fertile soil and moderate temperatures. Produce from the farms was shipped out via the bustling docks of the lakeside villages of Port Nelson and Wellington Square, as well as Brown's Wharf in the nearby village of Port Flamborough (which was to become Aldershot). Lumber taken from the surrounding forests also competed for space on the busy docks. However, in the latter half of the 19th century, increased wheat production from Western Canada convinced local farmers to switch to fruit and vegetable production. Farming still thrived though, and the resultant growth resulted in continued prosperity. By 1906, the town boasted both its own newspaper—the Burlington Gazette—as well as a town library and a local rail line that connected Burlington to nearbyHamilton. During the First World War, 300 local men volunteered for duty in the Canadian Expeditionary Force—38 did not return. In 1915, Burlington was incorporated into a town. As more settlers arrived and cleared the land, cash crops replaced subsistence farming. Gradually, mixed farming and market gardens became the dominant form of agriculture, and in the early 20th century the area was declared the Garden of Canada. The first peaches grown in Canada were cultivated in the Grindstone Creek watershed, which is located in the south-west part of the city. The farming tradition has passed down through the generations. Today over forty percent of the Grindstone Creek watershed is still devoted to farms, orchards and nurseries. Following the Second World War, cheap electricity from nearby Niagara Falls and better transportation access due to the new (1939) Queen Elizabeth Wayencouraged both light industry and families to move to Burlington. The population skyrocketed as new homes were built, encouraging developers to build even more new homes. On January 1, 1958, Burlington officially annexed most of the Township of Nelson, as well as Aldershot, formerly a part of East Flamborough Township. By 1967, the last cash crop farm within the city had been replaced by the Burlington Mall. By 1974, with a population exceeding 100,000, Burlington was incorporated as a city. The extremely high rate of growth continued, and between 2001 and 2006, the population of Burlington grew by 9%, compared to Canada's overall growth rate of 5.4%. By 2006, the population topped 160,000. Continued high rates of growth are forecast as farmland north of Dundas Street (former Highway 5) and south of Highway #407 is developed into more suburban housing. Burlington's public elementary and secondary schools are part of the Halton District School Board. Burlington's Catholic elementary and secondary schools are part of the Halton Catholic District School Board. French public elementary and secondary schools are part of the Conseil scolaire Viamonde and French catholic elementary and secondary schools are part of the Conseil scolaire de district catholique Centre-Sud (CSDCCS). Several private schools are also available in the city. There are 29 public elementary schools and 14 Roman Catholic elementary schools in Burlington. There are eight public high schools and three Catholic high schools in Burlington. Australian university Charles Sturt University has had a study centre in Burlington since 2005 and offers programs in Master of International Education, Bachelor of Early Childhood Studies and Master of Business Administration. .
Burlington is home to the Royal Botanical Gardens, which has the world’s largest lilac collection. Ontario's botanical garden and National Historic Site of Canada features over 2,700 acres (11 km2) of gardens and nature sanctuaries, including four outdoor display gardens, the Mediterranean Garden under glass, three on-site restaurants, the Gardens' Gift Shop, and festivals. There are 115 parks and 580 ha of parkland within the city. Lasalle Park located in Aldershot, is owned by the city of Hamilton but is leased by Burlington, which also assumes responsibility for maintenance. On the shore of Lake Ontario,Spencer Smith Park, is newly renovated with an observatory, outdoor pond, water jet play area and restaurant. 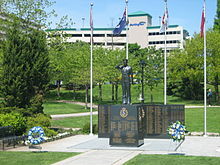 "Royal Canadian Naval Association Naval Memorial (1995)" by André Gauthier (sculptor) is a 6’4” high cast bronze statue of a WWII Canadian sailor in the position of attention saluting his lost shipmates, which was erected in Spencer Smith Park. The model for the statue was a local Sea Cadet wearing Mike Vencel's naval service uniform. On the black granite base, the names of Royal Canadian Navy and Canadian Merchant Marine ships sunk during WWII are engraved. On the granite wall, the names of all Royal Canadian Navy ships and Canadian Merchant Marine vessels which saw service in WWII are engraved. A monument commemorating the Korean War was erected in the summer of 2014 to mark the 61st anniversary of the armistice to end the war. The Art Gallery of Burlington shows various exhibits throughout the year from local to national and houses the largest collection of Canadian ceramics. The Gallery’s exhibition spaces, which feature new exhibitions every eight to ten weeks, are fully accessible and are free of charge to visitors. The Brant Street Pier was officially opened during the Sound of Music Festival in Spencer Smith Park on Father’s Day weekend, 2013. Thousands of people from Burlington and beyond flocked to the pier to enjoy sunshine and breathtaking views.. The Brant Street Pier is a signature destination and attraction in Spencer Smith Park at The Waterfront at Downtown Burlington. The pier extends 137 metres over Lake Ontario and provides breathtaking views of the lake and Burlington’s shoreline. Mapleview Centre - a two-storey mall, opened in 1990, with many upscale and destination stores Banana Republic, Guess?, XXI Forever, H&M, Bath & Body Works and Pink by Victoria's Secret) at Queen Elizabeth Way and Fairview Street, recently expanded in the Fall of 2009 with GUESS by Marciano, Zara, Coach,Aritzia and Sephora.